Q. Tell me about yourself. 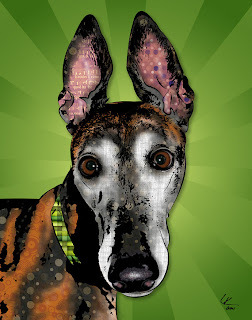 How did you start making the pop art dog portraits? I really have only a little art history. I've always enjoyed drawing as a child, and as I entered high school, I was allowed to skip all the basic classes and go straight to the advanced courses. Unfortunately, self esteem issues stunted my artistic growth, and after high school, I abandoned art altogether. It wasn't until I was 27 and left my home in New Hampshire and moved to Virginia that I decided to go to school for graphic design. Once I settled into my new career and adopted my first retired racing greyhound, I suddenly became inspired. 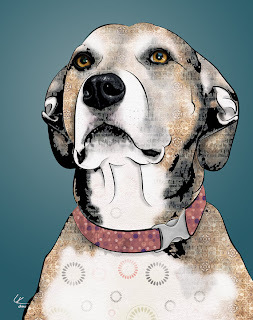 . . and thus began my digital pop art with my very first canine subject, Roscoe. Q. How do you make a dog portrait? The actual process is a little complex to explain. Basically, I work from one good quality photo. The photo is used only once. I separate the photo into black and white, where I extract just the black, to create a level of depth. After that, I illustrate it all by hand. Special attention is given to the eyes, the soul of the subject, which I think is very important to capture, and I color in my pre-made patterns. I choose patterns that work well together, and use several of the same patterned shades to create shadow and highlight. The source of my inspiration initially came from my first retired racing greyhound, Roscoe. I was smitten with his goofy personality and sleek beauty. I always say he saved my life. He brought me out of my shell, helped me meet people, volunteer, and overall just gave me purpose in life. It was he who made me want to express my feelings through art. Q. You have a great pop art sensibility in your work, and I love the collage elements. What are some of your artistic influences? I've always loved color and texture. Andy Warhol and the early comic book style of Roy Lichtenstein drew me in with their use of bright color and bold lines. My early work looked a little 'flat', and inspired by the texture of a real painting, I started using patterns to create depth. Q. You do custom portraits. How does that work? I encourage all my future customers to take a look at my Etsy shop. Under the section "Order a custom portrait" they can find examples of different sizes, options and prices. From that point, they can contact me to get the ball rolling. I require at least one large high resolution picture to work from, and of we always discuss colors and special requests. Once the portrait is complete, I email the proof to the customer for their approval before it is printed and shipped. Q. What do your customers tell you they like best about your work? My customers tell me how I've really captured the personality and spirit of their pet. This is especially true for pets that have passed on, as my customers really appreciate having such a fun tribute of their loved one. Q. Where can people find your work? I don't have an official website, but everything from prints, cards, magnets and information to commission custom portraits can be found at my Esty shop, www.popdogdesigns.etsy.com. 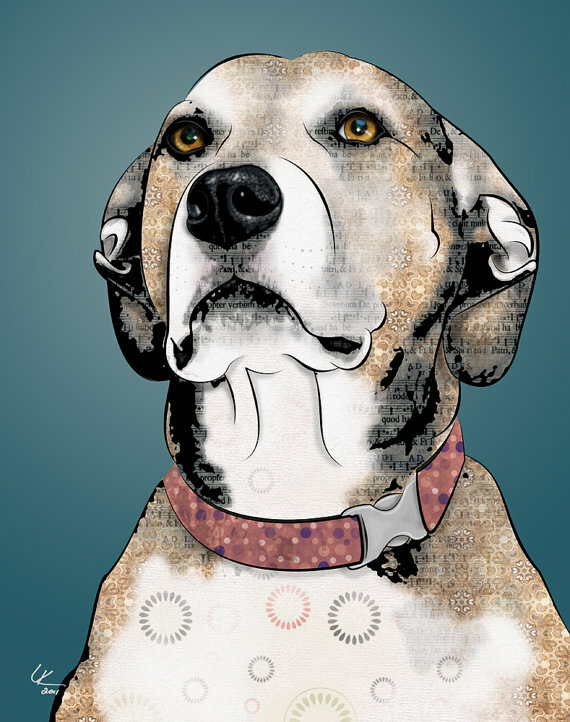 I also have a Facebook page, Pop Dog Designs, where I post specials, sales and finished custom portraits. A local vintage boutique called B. Original in Town Center of Virginia Beach carries my greeting cards as well as a few dog portraits. I also will show my work at 5 or 6 greyhound events this summer at various locations in Virginia, Delaware, Tennessee and Kentucky.